This week I opened an email and was flabbergasted. I was too late to plan on this particular project. I would just be winging it as usual. It’s not that I did not know about it. I knew. But I failed to plan. Not because I’m lazy, but because I really don’t know how. I don’t know how for me that is. Just a week or more ago a person asked me how to start blogging. I laid out a plan of action. And they are following the plan. When the person gave me an up date on their status which happened to be the day after I made the discovery of my own failure. It was very confusing to realize I can give great advise evidenced by the post Making Goals Stick but I don’t find it easy to see what it is I need to do. While doing homework to see just what it is I need to do to be more productive and be more useful to you, my reader, I ran across a product called Ultimate Productivity. While reading one of the authors from Ultimate Productivity, I was alerted to one of my biggest problems: A clean work space is necessary to aid in productivity. 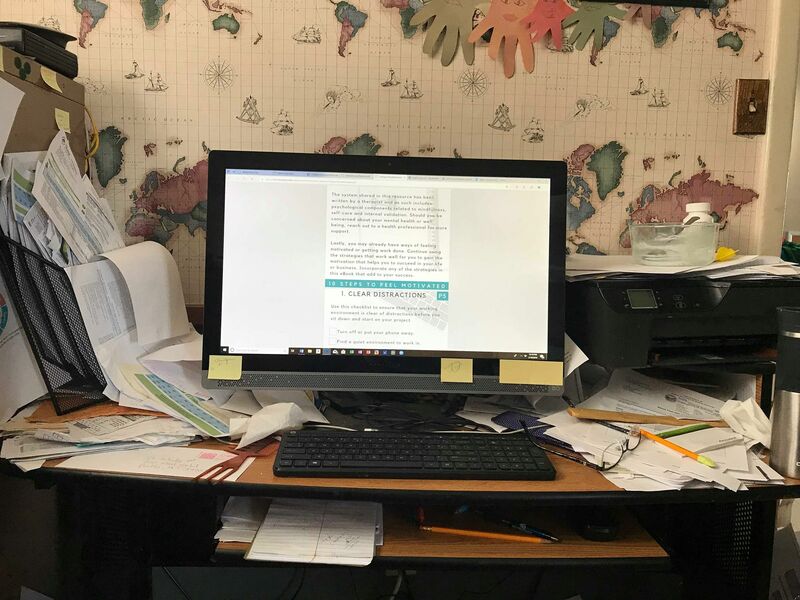 It’s not like I didn’t know clutter makes it harder to concentrate, it’s just a little hard to keep the clutter from piling up when filing is not your strong suit. Working from home can add to the clutter. And I don’t know about anyone else but working from home has another set of problems. I find the dishes, the animals and the laundry all vie for my attention. Recently a mentor told me to set aside 30-minute segments to manage my time. I did not get it. I thought this seems counterproductive, and quite frankly I did not quite understand it. But today as I was sitting down to write this article, I realized something. I had spent the previous day cleaning and preparing to implement a family chore list (I learned through the Ultimate Productivity). And this morning was the first day using the new family chores list. So, teaching my kids and making the program work took a bit of extra work but it was worth it. All that said, my point is, I was breaking my day into 30-minute segments and did not realize it. I feel more rested and more productive than I have in a long time. Tell me what makes you feel like you win in life. Do you know how to organize? Tell me if you want to learn more about being organized.